We are a leading Manufacturer of outdoor sports flooring, synthetic badminton court and synthetic volleyball court flooring from Mumbai, India. We are highly acknowledged workforce due to our specific and detailed use of industry grade components we with the similar concept and use are engaged in offering Outdoor Sports Flooring. Synthetic flooring is also known as Acrylic flooring. Synthetic flooring are the best-suited flooring for all types of outdoor sports grounds. A One Wood Craft has established itself as a preferred brand in the market for all outdoor sports badminton court infrastructure solutions. 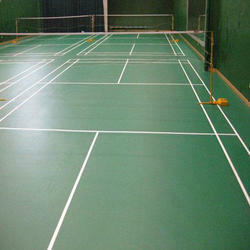 Our Synthetic flooring are air-cushioned giving extreme level of safety & pleasure to the players. A One Wood Craft offer best Acrylic flooring, which is a cost effective solutions for many customers. Synthetic Sports Flooring for badminton court is done in thickness of 4.5 mm thickness & 6.5 mm with best quality and standards. 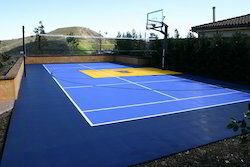 Outdoor Shuttle court flooring has enough cushioning ensures good stability and shock absorption.